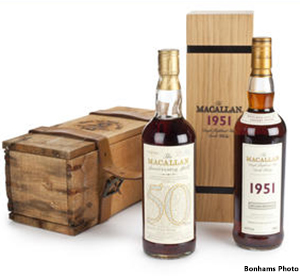 April 30, 2013 – The first Bonhams whisky auction of the year in New York City saw vintage Macallans leading the bidding, with a 50-year-old Macallan Anniversary bottling (L) bringing a winning bid of $40,460 (including premium). Another 50-year-old Macallan, the 1949 Millennium decanter, sold for $19,040, a 57-year-old Macallan Lalique decanter went for $15,470, while a 1951 Macallan Fine & Rare bottling (R) brought a winning bid of $7,140. The Bonhams New York auctions are unusual for the large number of American whiskeys usually on the block, and a rare bottle of George Washington’s Vatted American Whiskey sold for $1,190. This was one of 250 bottles produced to commemorate the restoration of George Washington’s Distillery, with a vatting of whiskeys from 11 different U.S. distilleries including Jack Daniel’s, Jim Beam, Wild Turkey, Maker’s Mark, Woodford Reserve, Barton, and George Dickel. Other American whiskeys on the block included a 1911 Overholt Rye ($1,190), several A.H. Hirsch 16-year-old Bourbons, and a variety of Pappy Van Winkle expressions. The next Bonhams auction in New York is scheduled for October 13, with auctions in Hong Kong on May 23 and Edinburgh on June 12 and October 2.